It’s Day 12 of our 12 Days of Christmas Movie Reviews and I’m closing it out with Elf!! I’m not sure where we’re at as far as how many movies on our list could be considered NOT Christmas enough, but not only do I not care, it doesn’t apply to Elf at all anyway. This is a Christmas movie through-and-through. No ifs, ands, or butts. And not only are there are many references to classic Christmas films (including a Burl Ives inspired snowman), it’s a great original story about Santa Claus and Christmas magic as well. But Elf is really about, well, an Elf. His name is Buddy (played with childlike wonder by Will Ferrell). 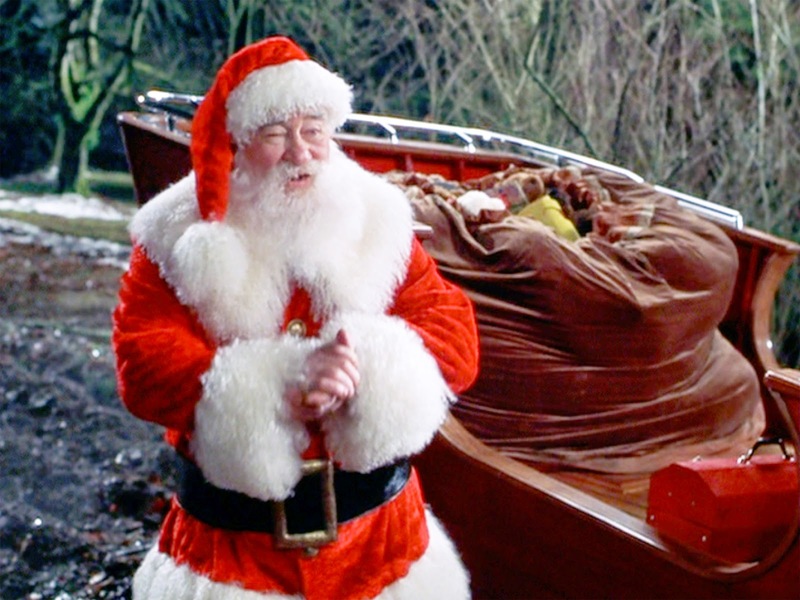 As an infant, he snuck into Santa’s bag on Christmas and was a stowaway to The North Pole. Once he’s discovered there, Santa decides to keep him and raise him as an elf, and places him under the care of Papa Elf (Bob Newhart). 30 years go by and Buddy still hasn’t realized he’s not an elf, despite being terrible at all the elf jobs (and not to mention that he’s now several feet taller than all of them). 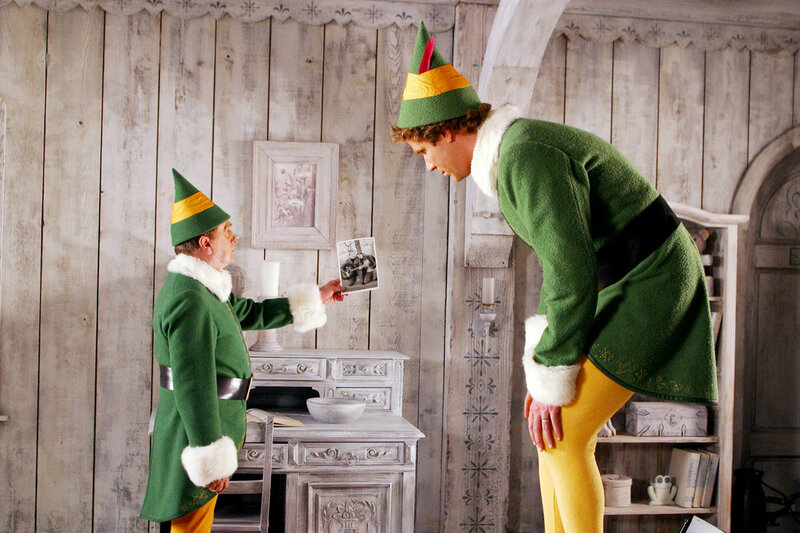 As he grows more and more frustrated, Papa Elf finally tells him the truth and sends him on a journey to New York City to find his true father (James Caan). Along the way, He’ll also fall in love with Jovie (Zooey Deschanel) and help to bring the Christmas Spirit in all those around him. I consider it to be the best of the “modern” Christmas movies (and that’s a wide range of movies that includes A Christmas Story and Christmas Vacation). Having the incredible Ed Asher play Santa Claus is an inspired choice. He’s just as good as Edmund Gwenn was in Miracle on 34th Street and that’s saying a lot!! He has a mischieveious, magical twinkle and I just love his portrayal. But casting the legendary Bob Newhart as Papa Elf just might be the icing on the cake and he is able to bring out just the right amount of emotional weight to a role that could have been overacted and forgettable. The same goes for Will Ferrell. His character, as written, could have been annoying but he’s somehow just the right blend of innocence and purity. But what I love most about this movie is that it doesn’t try to go too raunchy like many recent Christmas films have (Bad Santa for example). There are a handful of innuendos here and there, but never pervasive. Make no mistake: This is a great family film. Buddy’s Christmas spirit is contagious and you will feel it, too. Oh, and the music is INCREDIBLE!! I love it when the reindeer fly over New York City. My heart swells every time. Elf has become a Christmas staple at our house. It’s one of my wife’s all time favorite movies, and though my daughter is too young to fully appreciate it (it’s her first Christmas!! ), we are already starting this tradition with her. So that concludes our 12 Days of Christmas Movie Reviews. We know that we miscounted and on Christmas Eve instead of Christmas Day, but oh well. Maybe next year I’LL learn how to count (Yes, it was my fault). But whatever you’re doing and however you celebrate this year, we hope you’ve had fun with us and we wish you a Merry Christmas and Happy Holidays!! On a side note, don’t try to eat spaghetti like Buddy does. I made that mistake once and let’s just say it wasn’t pleasant for anyone involved.